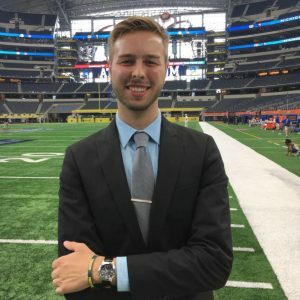 I started this blog when I was 17 years old, fresh out of college, starting my first semester of law school and at the same time interning for the Orlando Predators, a professional arena football team. Looking back, I guess you could say I was of two minds, or rather, I couldn’t make up my mind. My mom urged me to start this blog about my experience, convincing me I would appreciate it when I got older. At the time, I didn’t realize how unorthodox my journey really was. That first semester of law school I grew in ways I never expected. Not only did I grow taller by a couple inches, and added a good twenty pounds of stress, but I learned how to rise to extreme challenges. I also got to experience what ruthless competition looks like off the field. Where football is blatant and obvious competition, law school oozes with a sinister competition that my naive 17-year old self didn’t really understand. I forged through that first semester, blistering my brain, and now, a few years later, head back up, I am proud that I actually passed all my classes. I didn’t have the grades to make the cut, but it sure showed me how to blow through my comfort zones. Since then I’ve been picking up one experience after another that has stretched me more and more. Working behind the scenes for three seasons at the Predators doing everything from game day operations and managing promotions, to football operations and managing the needs of players, my passion for the game has multiplied. That experience launched me to The SkyBoat, a non-profit sports news organization, covering collegiate sports as well as the NFL. I started as a writer and am now the sports editor. I’ve traversed the country more than once racking up one thrilling moment after another behind the scenes at major games, bowls and press events. I went to law school on the advice of my parents because of my interest in the constitution and our nation’s history. My great, great grandfather was a lawyer and my mom said he never used his law degree. He just hung it in his fish house. My family has said getting a law degree is about the journey, not the destination; whether I practiced law or not, it’s the experience that mattered. And considering my lifelong love of history and the fact that I already finished my undergrad at 17, it seemed like the next best thing to do. I haven’t decided if I will go back to law school or not. But what I’ve learned so far is that embracing the game of life, and all its twists and turns along the way, is the best path to take, regardless. Every day I learn something new that stretches me a little bit more. And this is where I share it. Hope you enjoy a peek into my journey.